I have been writing this simple online journal since June and I love it so much! If you are wanting to start a journal, here is a simple and effective way to do it. 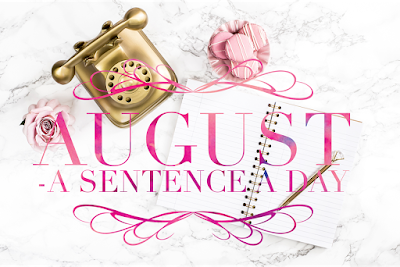 Just one sentence a day! Let me know in the comments if you are going to do this, I would love to follow your journey! August 1. Back with working with principals as they get ready to do their best for teachers, students, parents and all who are concerned with public education. August 2. I love working with new principals, seeing their excitement, worry and delight in having their dreams come true! August 3. I am a part of a board who looks closely at how to promote our city and all its wonderful attributes and I always walk away feeling so good about where I live! August 4. My husband took a trip to the Lake of the Ozarks, and while the first few minutes of being in complete charge of my life is wonderful, I start to miss his presence dreadfully. August 5. My world came to a sudden halt when I learned that my friend nearly died today, she's fighting cancer and this invasion of pulmonary edema hit her hard. I hit my knees and prayed all I could. August 6. When he learned about my friend, my husband cut his trip short so he could come home and be with me. August 7. Our neighbors and friends celebrated the work of first responders, policemen and firemen today by hosting an appreciation event at our neighborhood pool with free hot dogs, swimming and snow cones. I love where I live! August 8. So happy that my husband could spend some of his short retirement with our daughter in Chicago, learning about hot dogs and loving on her dog, Huxley. August 9. Enjoyed our staff meeting in Columbia today as I met the new folks in the office, saw the new training area and saw a long time friend. August 10. It looks like my friend will be going home from the hospital today with some new meds and feeling snappy and fine! Praise the Lord! August 11. Laughed until my belly ached with a group of women who know how to have fun, something I think I forget from time to time. August 12. A day that will go down in history as I treated my sister, the mother of the groom, and my mother, to their very first pedicures. August 13. A beautiful August wedding for my youngest nephew and his new bride! August 14. Another beautiful ceremony here in New Town for two of New Town's favorite people, John and Kay. August 15. Long day of meetings but blessed with seeing three of my friends' daughters, one expecting shortly, one whom just had a baby a month ago and one who will be married soon. Our dinner was full of love, laughter and watching the circle of life blossom right before me! August 16. Met with friends at a party who bolstered my ego with praise and hugs at a clothing party where I felt totally inadequate and dumpy. August 17. Feeling the rush of new hope and expectations with the beginning of school in Winfield, where I will go and and hopefully contribute to their success in some small way. August 18. I had one of the most fun experiences of my life when I got to board a huge houseboat and cruise the Mississippi while playing bunco! August 19. Pool party with the New Town Men's Club was a lot of fun and our drunken watermelon was a huge success! August 20. Second pool party of the weekend was so much fun with our neighbors from the Beach District! August 21. We had dinner with new friends at their home and talked until 11:00 that night, meaning I should start wearing a watch so I don't wear out my welcome! August 22. I spent the day with 200 other Improvement Consultants listening to the wise words of Jan Chappuis talking about educating our children. August 23. Day 2 of Jan Chappuis, who I know has good intentions but is teaching things I'm not sure I believe in anymore. August 24. An unexpected day at home to catch up on all things paperwork related. August 25. The car that Ashley chose when she was a high school senior, that got her safely through college and her first seven years of marriage and a new career, was sold today to a young woman just starting her same journey. August 26. My husband went to a ball game and I decided that a stay-at-home night eating pizza and watching a silly movie was just what I needed. August 27. Absolutely nothing is planned today and I hope to keep it that way! August 28. An unexpected, lovely morning with breakfast out and a trip to Ikea where we planned our kitchen addition! August 29. A quick trip into my office in Columbia allowed me plenty of time to plan my week's blogging and cooking so I have to admit that sometimes I am grateful for long commutes! August 30. Taught my first class in Adolescent Literacy and wow, it was amazing and fun and thrilling and hopefully, interesting! August 31. I am so ready for fall and for me, the last day of August is the last of summer. I would love to find a group of people who would like to do this sentence a day journaling. If you are not a blogger but would do this on Facebook, let me know in the comments below. My idea would be to help each other as writers to broaden our writing styles, vocabulary, sentence structure, etc. I would be happy to start a Facebook group just for this idea! I love this concept, Terri! Thanks for sharing it with us!